Europe Biobank Week 2018 took place in Antwerp on 4–7 September. It was attended by 640 international participants. The German Biobank Node (GBN) had a presence at the conference with its own, well-visited stand. The latter served as a meeting point for the German Biobank Alliance (GBA) community and moreover invited discussions with the other European nodes at neighbouring stands and BBMRI-ERIC representatives. Contact was also established with countless EBW visitors, such as company representatives, during the conference. The session presentations and posters showcased covered the entire range of biobank-relevant topics, such as quality assessment, harmonisation, IT structures, sustainability, ethics, stakeholder involvement and the challenges posed by the EU-GDPR. GBN representatives and GBA members participated in the programme with lectures and posters: Dr. Ronny Baber (head of the LIFE-Biobank in Leipzig) spoke on the GBA concept for ring trials for liquid samples as part of the quality management system for biobanks. Dr. Martin Lablans (German Cancer Research Center, DKFZ) gave a presentation on biobank networks, and conditions and solutions for the international sharing of data and biomaterials. PD Dr. Sara Y. Nussbeck (head of the UMG Biobank in Göttingen) explained the further training programme for technical staff at GBA biobanks. Another highlight was a session in a debate format on the question of whether patients should be informed of research findings. Dr. Ronny Baber took part in this session as a member of the team in favour of providing feedback on research findings. During Europe Biobank Week, Prof. Dr. Jens Habermann (head of the Interdisciplinary Centre for Biobanking-Lübeck, ICB-L) officially took over the presidency of the European, Middle Eastern & African Society for Biopreservation and Biobanking (ESBB) from Balwir Matharoo-Ball. 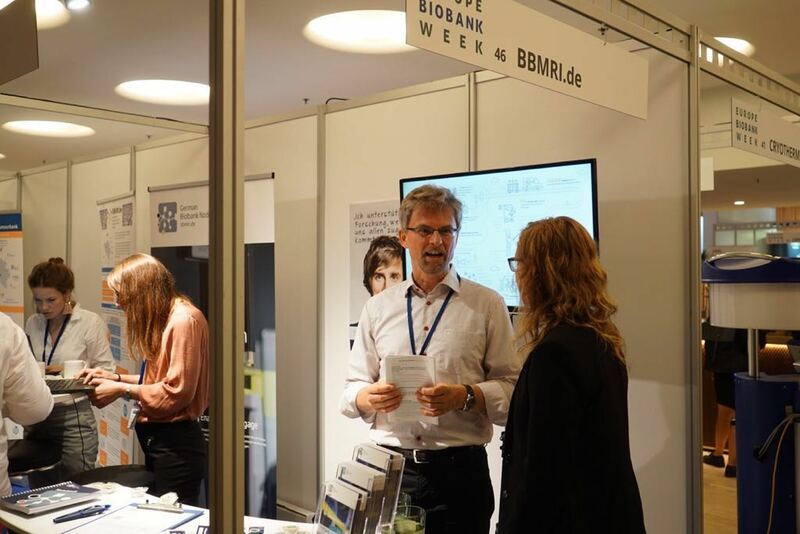 He announced that Europe Biobank Week will take place in Lübeck on 8–11 October 2019 in the coming year. See here for the official BBMRI-ERIC report on Europe Biobank Week. This article originally appeared on the German Biobank Node website.